Bremer Bank is a privately held financial services company owned by Otto Bremer Trust. Bremer Bank is based in the state of Minnesota and provides various financial services such as banking, wealth management, investment and insurance products. 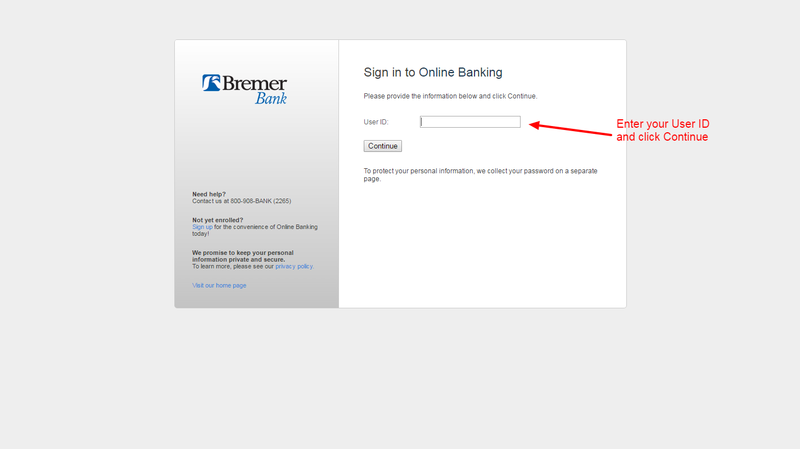 Bremer Bank Online Banking makes managing your finances accessible. This free service prompts clients to pay their bills, fund transfers all from their own laptop or mobile device. If you have any questions on how to enroll, log in or reset password, check out the guide below to learn how. Step 1- Go to your browser and type https://www.bremer.com (or click this link). 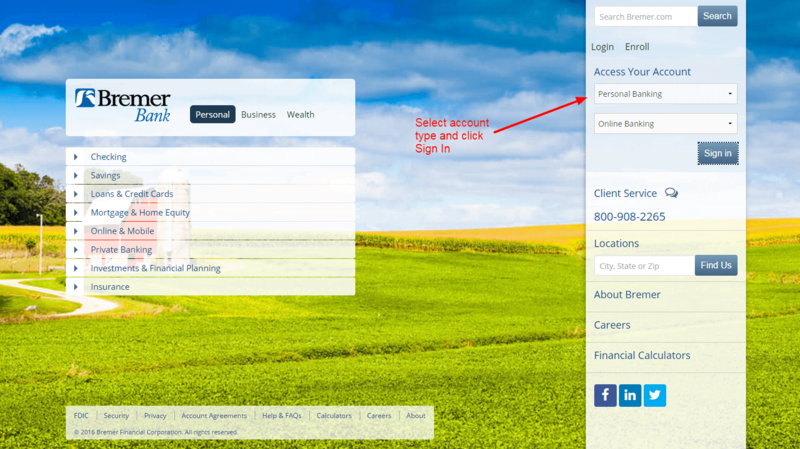 Step 2- In the Log in section, select the type of account you wish to access and the service (eg. Online Banking). Click Sign in. Step 3- Enter your User ID and click Continue. If you are trying to access for the first time, you will me directed to a One-Time security code to verify your identity. You can select to send the code to your phone via text message or a call. Once you have entered the code, enter your password to log in to your online bank account. If you have forgotten any of the information required to log in, contact Bremer Bank and they will help you reset your password or retrieve your user ID. Contact them at 800-908-2265. 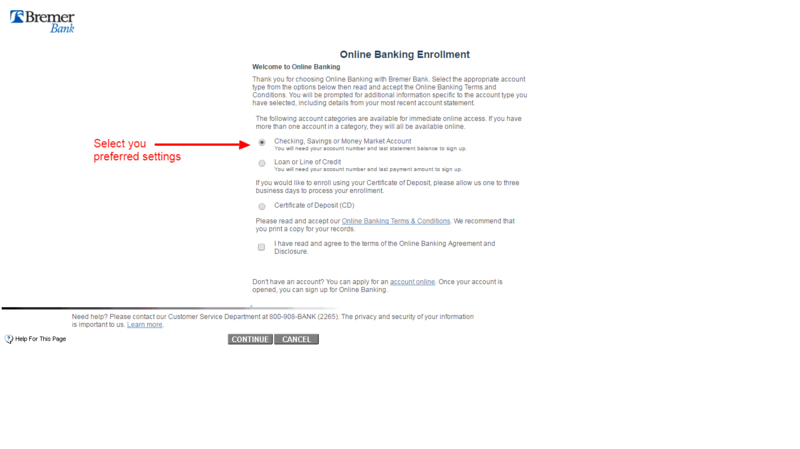 Step 1- In the same Sign In section, select the Enroll tab. Select the type of account you want- Personal or Business Online Banking. Step 2- Select the categories you wish to have for your online access. Select if you wish to enroll using your Certificate of Deposit. Read and accept their Online Banking Terms & Conditions and click continue. 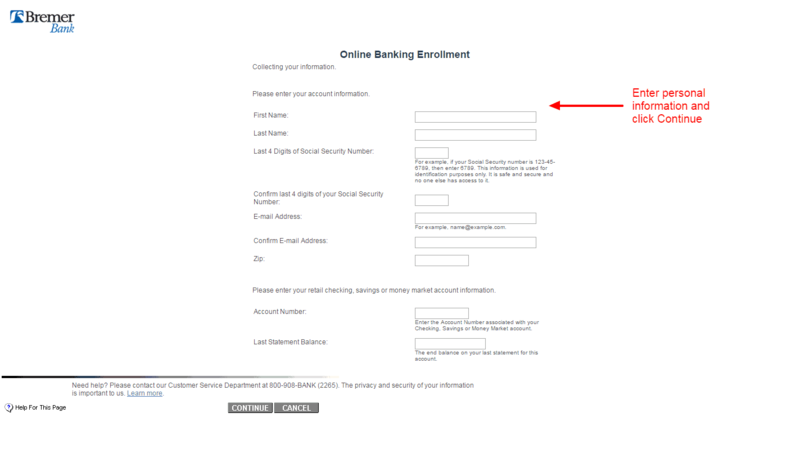 Step 3- Fill the online banking enrollment form. Click continue. After you successfully complete your Account Information, you will be prompted to create your User ID and password. Follow any additional steps required until you receive confirmation that your online account has been created and you are able to access it. Money transfers between bank accounts. Bremer Bank and other financial institutes are closed on the same holidays.